HeLa cells growing in medium containing serum were serum starved for 12 hours and stimulated with forskolin. Where indicated, cells were incubated with H-7 (10 μM), Ro 318220 (1 μM), PD 184352 (2 μM) or no inhibitor for 1 hour, or BIRB0796 (10 μM) for 2 hours, before stimulation with PMA (400 ng/ml) for a further 15 min. PDE3A was immunoprecipitated (IP) from 3 mg of each cell extract with 20 μg anti-PDE3A (1095 – 1110). 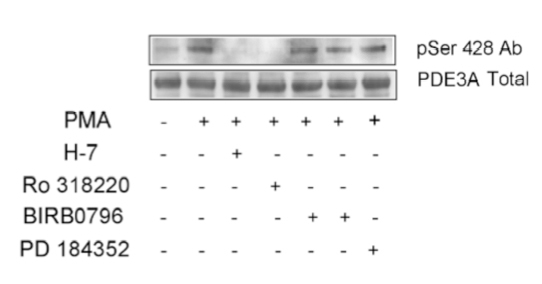 The immunoprecipitates were, subjected to SDS-PAGE, transferred to a PVDF membrane and immunoblotted with anti-PDE3A (1095 – 1110) [lower panel] or anti- PDE3A phospho Ser 428 [upper panel]. Binding of the primary antibody was detected using rabbit peroxidase conjugated anti-sheep IgG antibody (1:10.000 dilution, Pierce) followed by enhanced chemiluminescence (ECL, Amersham).